This holiday season, watch your most memorable family moments with an Epson 1080p 3LCD Projector ! 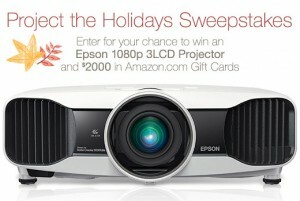 Amazon.com, one of the largest web store in the world, is giving you the chance to win an Epson 1080p 3LCD Projector plus a $2,000 Amazon.com Gift Card by entering the Project the Holidays Sweepstakes. Like Amazon.com on Facebook using the “Like” button. Confirm that you are 18 years of age or older and a US resident (eligibility requirements) by checking the applicable box. Click the “Continue to Enter” button and follow the instructions to submit your entry. Please note that subscribing to the Amazon.com daily deals newsletter is optional and won’t affect your entry. One lucky winner will get her/his hands on an Epson 5030UB 2D/3D 1080p 3LCD Projector and will receive a total of $2,000 in Amazon.com Gift Cards. The sweepstakes started on October 26, 2014 and may be entered until 11:59:59 p.m. (PT) on November 15, 2014 by legal residents of the 50 United States or the District of Columbia, who are at least 18 years of age or the legal age of majority in their state of residence at the time of entry. Limited to a maximum of two entries per person and Amazon.com account (i.e. one entry per person and Amazon.com account via Facebook and one entry per person and Amazon.com account via Twitter). love ti win the sweepstake,i love it.